Welcome to TAY Board Game Night! Each week I hope to bring you a new board game to try out, throw in a mini blurb about why you should play this game, and then add some alternate playstyles or challenges for you to try while you play. 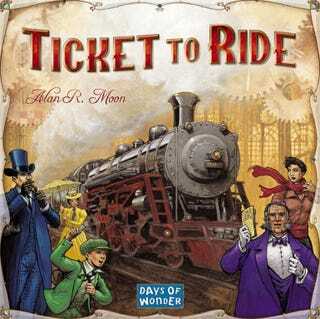 This week is Ticket to Ride! Ticket to Ride, is kind of a staple of my modern board gaming library and one I’m quick to recommend too. To me, at least, its a nice gateway game between the mass market style board games like Monopoly and hobby gaming board games like, well, anything I talk about here on TAY. Ticket to Ride isn’t terribly complex, and is fairly straightforward. This makes it easy for newbies to pick up, but it isn’t with out its own strategies and depth. If you’re looking for a quick-to-learn hobby game, or simply something light for the evening this game is wonderful. The basics are as follows; You and your opponents are going to gather hands of colored cards. You’ll turn in various amounts of the same colored cards equal to the same amount of slots on a route then drop your trains on the tiles on the map. You’ll have a few route cards that you’ll look to complete and score points, the longer or more complex the route, the more points. String together a couple of specific routes, and you’ll be making some serious points! There are quite a few versions of Ticket to Ride out there, from a simple map of the United States, to different countries and map expansions that cover a variety of places all over the world. As far as Challenges go, just go play a round or two this night (or weekend) and come back here and let me know your highest Ticket to Ride score. If you’re looking for alternate game modes there are a few expansions that will help change up the game. There is a digital version available too, if you’re unfortunate enough not to have people or a place for the physical game. Have fun and don’t forget to come back and let me know what you think!